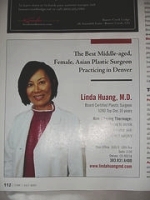 WorldUnfurled found an ad in a local Denver paper for Linda Huang, a plastic surgeon that carried the odd headline, "The Best Middle-aged, Female, Asian Plastic Surgeon in Denver" and wondered just how many middle-aged, female, Asian plastic surgeons there actually are in Denver. If this ad does anything, it certainly describes what you're getting very concisely. Charlotte Church, the former child prodigy opera singer, now bulging with womanhood, is in talks with lingerie maker, La Senza, and may sign a six figure deal to model the company's line of intimate apparel. According to reports, after seeing pictures of Church on vacation in Antigua with her boyfriend, Gavin Henson, La Senza thinks the curvy Church would be perfect for the job. The Superficial, however, after viewing the images, thinks La Senza is out of its mind. UPDATE (3/4/07): And yes. Charlotte Church is pregnant which is why you are all finding this page.